Smartphones are quickly becoming the primary computing and communication platform for people’s daily tasks. With the rise of social networks, people are now comfortable with frequently updating their social profiles with their current activities and/or locations. 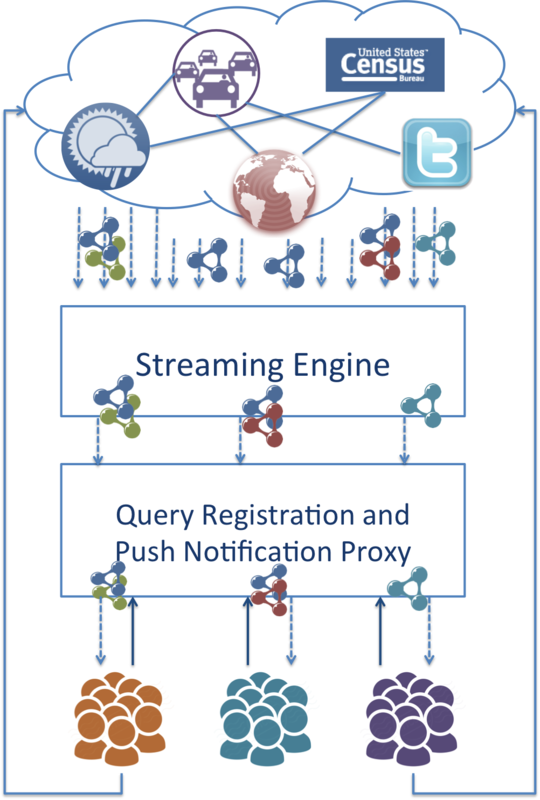 This new source of information, social signals from microblog platforms, has been found to be especially useful in disaster management and relief operations. For example, during the recent Beijing flash floods, people took to Twitter to provide info rmation about the flooded areas and collaboratively developed a live crisis map of the floods impact using Google Maps. 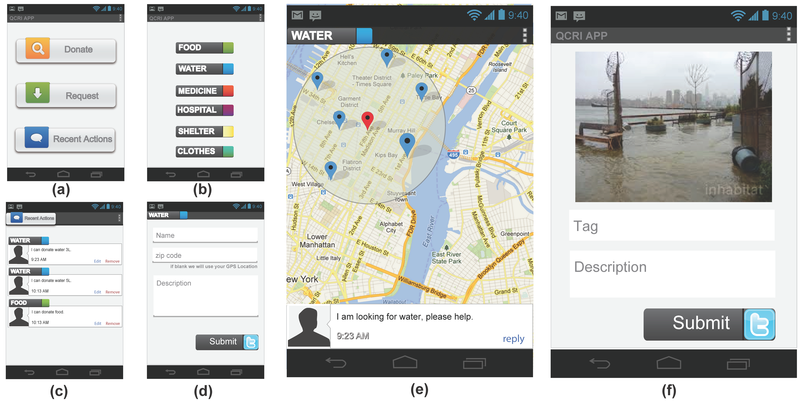 By integrating crowdsourced information with Geographic Information Systems (GIS) data or other open datasets released by the local government, some technical volunteers have developed useful mobile applications for disaster reliefs. However, each organization usually has its own application that creates or consumes data stored in standalone databases, or even worse, in spreadsheets. This means most of these applications are built in silos without exploiting the potential of being “interlinked” with other data collected from other organizations, or even the government. The lack of expertise and the cost for building mobile applications cause relief workers to turn to more manual steps for merging various reports from volunteers. Consequently, the increasingly unorganized and scattered information become noise in the system and can sometimes slowdown the decision making process. One major challenge is how to effectively integrate data generated by multiple parties, including the “crowd”, relief organizations, and governement agencies. We address this challenge by using Linked Data principles to enable the reuse, extension and integration of heterogeneous structured data from distributed sources. However, consuming and generating Linked Data is difficult especially on mobile devices. In this project, we are also focussing on reducing the barrier to the adoption of Linked Data technologies on smartphones. Our vision is to build up an ecosystem of multi-language and multi-modal tools and volunteer developers around mobile technologies. We envision volunteers working with relief organizations to collaboratively customize, develop, or use mobile apps during a particular crisis to perform a variety of tasks – such as data collection, notification of aggregate information to key decision makers, and co-ordination of relief efforts. The use of mobile technologies will greatly speed up these relief operations that currently suffer from lack of technology or insufficient human resources. The Punya project is aimed at enabling this ecosystem to exist by addressing the key mobile requirements of the humanitarian sector and opening it out to mobile volunteers by reducing the barrier to using these technologies. This app is inspired by MatchApp, where requests for resources are met with the availability of those resources. Consider this resource match-making scenario: Alice lives in New York City. After Hurricane Sandy hits, Alice wants to help people in need. Bob has been affected by the crisis. Both Bob, the requestor, and Alice, the donator, can place the donation and request for items within our app as shown in the figure below. They can also view/edit/remove recent list of their activities as shown in (c). Alice chooses to donate water, so she checks up all the people within a 3 miles radius of her location who are in need of water on a map as shown in (e). Bob had previously requested water by using our app (d). Alice selects Bob from the list of people in need. Alice and Bob can message directly with each other to arrange the exchange. On his way to the grocery store, after a severe hurricane, Joe noticed many parts around his community are in bad conditions. For example, fallen trees are blocking the road and some can be dangerous for the pedestrians. With our WeReport app, he could take either a picture or a video of the scene. He decides to take a picture of the road, by adding a ``tag'' and a ``description'' to the image as shown in (f) in the figure above. Punya is built on top of the App Inventor block programming system, which allows non-programmers to quickly create mobile applications for the Android operating system (OS). It uses a graphical interface that allows users to drag-and-drop visual objects to create an application that can run on Android devices. Punya adds advanced capabilities to App Inventor including Linked Data capability, sensors, offline-tolerance, and cloud services. Leveraging Linked Data enables developers to reuse the thousands of useful datasets out there in the Linked Open Data cloud and allows the data generated to be easily integrated with data from other apps. Furthermore, Punya also provides easy access to sensors and other personal information on the smartphone.By moving a few blocks and putting them together, you can build a crowdsourcing app that reports live events happening in your community. Another possible app is one that alerts its users when more than thousands of people are tweeting an nearby and upcoming snowstorm. The push notification service is good at cutting through the noise and delivering the useful information to the hands of the people that want it. For example, field workers who use a disaster relief app might want to be notifid when the specific kinds of resources has arrived. Local volunteers who use MatchApp want to know when some people are in need that they can offer help. With push notification, an app can always delievers messages to people directly to update the most recent situation. Punya makes it easy for apps to use LD-based push notification to send up-to-dates information. The sensor components provides many high-level components for access to smartphone sensors and personal information. For example, it has components for reading the GPS location, taking photos with the camera, receiving SMS texts, and sending Twitter messages. All the built-in functions are just a "block" away. To try Punya, log into our punya instance with a google id. Then import the applications below. 1. An app that queries dbpedia and generates a list: download it here. 2. An app that queries dbpedia and displays it on a map: download it here. In these videos, we will show you how to create and use our featured app, WeReport. WeReport is an crowdsource app that allows its users to voluntarily generate short reports about what's happening nearby. The report can contain a photo taken by the user and a short description describing what is going on. On the other hand, a user can also subscribe to the topics of events that they are interested. Whenever an event was reported by the crowd, those who subscribe to a specific topic that matched the event will receive an alert through push notificaitons according to their current location. For example, if a voluntary relief worker wants to know when there are power outage reported in the community and offer helps just in time. Furthermore, you will also learn how to modify WeReport app to meet your needs. Maybe you want to build a traffic accident report app, or maybe you want to build an app that reports live events happening in a country fair! With a few changes in the blocks, you can have your own app! The Punya project is currently developed at Decentralized Information Group at MIT CSAIL. If you have any comments or questions, feel free to email us at punya-info@csail.mit.edu.